Not only am I out of order, I'm off now by 2 days as well. Good thing I will have some time the next few days to play catch up. I finally finished LOAD 11: School Days. I loosely interpreted this prompt. I wanted to use this CK Sketch, and also submit this for the ScrapFit "blank canvas" challenge. I really wanted to use these photos. I am ready to tell this story. Today was quite the day for Joshua. SInce Dec 2007, Joshua has been riding to school on the bus, but in his wheelchair. 4.He walked onto the bus with my help. 3.He sat down in a seat, just like his friends. 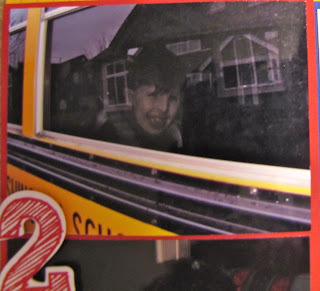 2.He rode to school. 1.His aide Kelly, helped him walk off the bus and she and I walked with him into class. He knew I was there, but never turned to say goodbye once he was in his classroom. His teacher told me this was the highlight of her professional career. John, Evan and I are so proud of Joshua. I can’t believe how very emotional we are today. This is a HUGE milestone for Joshua. What we've seen most from Joshua lately, is his desire for independence. I know this is only the beginning of new territory for Joshua, It will only help and encourage him. He just wants to be like everyone else. He took a step in that direction today. I can’t wait to see what comes next! Awesome layout Derv!!! So happy for Joshua's achievements! Good wishes for many more to come! 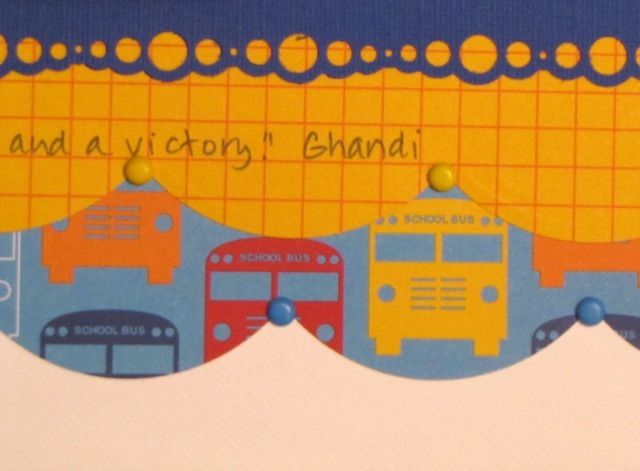 Love what you did at the top with the border punch and the bus at the end. The title is perfect and the story to tell...priceless! This is fabulous, Devra! The extra time it took is well worth the end result. lovely 2 pages you have made great title to. I love this page, it is soooo fun! Thanks for playing with ScrapFIT!